You are here: Home / Collaboration And Convergence / Selling or Telling? Do you spend a lot of time rattling off features and benefits to customers and colleagues, thinking they will buy what you are “selling?” Regardless of whether you are a small, mid-sized or startup business, dial in. You may be wasting everyone’s time. Including your own. 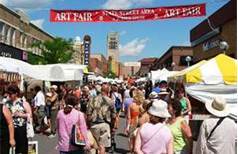 Last evening, my husband and I strolled the Ann Arbor Art Fair, one of the largest juried fairs in the USA. There was a lot of low-key story-telling going on. And it works. It puts the buyer into the seller’s process. It makes the perceiver at one with the artist’s perception. Collaboration. Hardly a bunch of status-quo sales blah-blah-blah. You tell the story of the artist, their creative process, and how you came to acquire this art. You continue the art of their storytelling. You carry their art forward. There’s an art to storytelling. And these artists have mastered that storytelling mojo, hands down. How come the art fair artists “get” the message that the rest of sales people trained by status quo processes have missed? After all, artists are working 100% commission as well. And then some. Did you ever think what would happen if you started a customer conversation with: “Social media marketing sounds like a load of trite mumbo jumbo. The kind that boosted one restaurant’s revenue by 300% last month.” Now that’s a story folks would like to hear. They uncross their skeptical arms and lean in to hear more about the hero or heroine’s tale involved in the quest for revenue and profitability. Customer conversations are story telling. They are interactive with the folks watching and listening to you. If you start them off by spilling your features-and-benefits guts all over the place, you’ve just reinforced your lack of credibility. You are mentally dismissed by potential buyers and thrown into the commodity selling-style bucket. Summertime means art fairs. Spend some time wandering around and speaking to vendors. They aren’t hawking their wares. They are the physical embodiment of their own, unique artistic processes. Their output is their art. There are some pieces they are very proud of. Others, not so much, in spite of the output being wonderful. Talk with artists and become one with their story. Then take that conversation back to your prospects, customers and colleagues. Become that artist, instead of a sales person. You are right on the money, Babette, and I appreciate this post. Stories have connected nations since the beginning of time. It helped people build relationships, dream, aspire, trade, persuade, learn, and much more. Top sales professionals use it to build connections with their prospects on a deeper level. Storytelling open up the possibilities to connect with the “emotional brain” which also happen to be the “artistic brain”. The emotional brain understands the future, and the “benefits” of using the product in the future. Facts only tell the left-brain about the cut-and-dry possibilities, but only stories allow the emotional brain to envision USING these benefits soon. I appreciate your insight, Mazen. I’d like to see more emphasis on the value of emotion in the sales process. I feel many sales professionals find story-telling rather risky. They would rather talk scripted sales-spiel instead. Passion and emotion in the business development process lead to perceived value on the part of the customer, as well as an enhanced feeling of self-worth on the part of the sales person. Well worth the journey.